Stone Images IX featured 28 stones collected from Washington, California, New Mexico, and Alaska by members of the Puget Sound Bonsai Association’s Viewing Stone Study Group. Viewing stones, as they are known in the United States (a.k.a. suiseki in Japan, or scholar stones in China) are naturally formed stones valued for their shape, color, beauty, pattern, and/or for what they can be seen to represent. Some collectors choose certain stones because they see in them natural scenes, such as scenic vistas or animals, or naturalistic imagery within the face of the stone. After being collected, viewing stones are typically displayed on wooden stands (daiza); some stones are polished. When paired with bonsai, the viewing stone and bonsai tree each enhance the qualities of the other, and together, create a scene that might be found in nature. 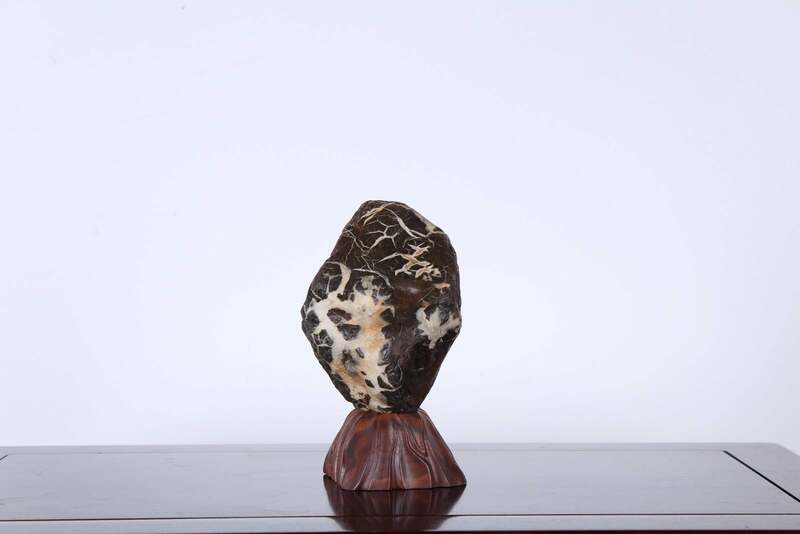 The practice of collecting and viewing stones originated in China about 2,000 years ago; it was introduced to Japan in the sixth century CE, and is now practiced worldwide. Stone Images IX was the ninth in a series of exhibits organized by the Puget Sound Bonsai Association’s Viewing Stone Study Group. Since the exhibit series’ inception in 2010, 250 viewing stones collected from countries around the Pacific Rim, including the Pacific Northwest, Wyoming and Alaska have been displayed at Pacific Bonsai Museum. Information about each stone–including viewing stone classification, place of origin, name of the collector, and (in many cases) the poetic title given to the stone by its collector–was displayed beside each stone in the exhibit. The entire exhibit was displayed in two, glass-fronted cabinets lining the interior of the Pavilion at Pacific Bonsai Museum.